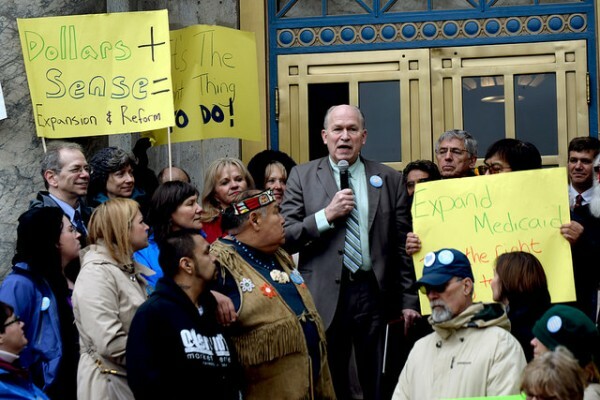 Governor Bill Walker spoke at a rally today in favor of Medicaid expansion outside the Capital Building in Juneau. The event, sponsored by the Alaska State Hospital and Nursing Home Association, is another strategy from proponents of Medicaid expansion to get lawmakers to bring the issue to a vote in the Legislature. Standing on the capital steps in sporadic drizzle, Annika Ord of Juneau said that as a recent college graduate she falls into the coverage “donut hole” for health insurance. That prompted many of the hundred or so rally attendees, along with a handful of democratic lawmakers, to begin snapping selfies with their phones. Governor Bill Walker told the crowd expanded healthcare coverage is both an economic and moral necessity for the state. “Multiple polls show overwhelming support for expanded Medicaid. Healthcare is not a partisan issue, it’s an Alaskan issue, and we’re going to accept it,” Walker said over growing applause. But Republicans lawmakers say the state isn’t ready, and that there is no use expanding Medicaid when the state’s current version of the healthcare system is not working. Thompson doesn’t believe the issue will not come to a vote this session. But Governor Walker says he will call back the Legislature if the expansion plan doesn’t come to pass. Juneau resident Pat Sidmore attended the rally, and thinks the politics are obscuring the very real need to give health coverage to more low income Alaskans. After his rally speech, the crowd of supporters started singing Walker “Happy Birthday.” He turned 64. Alexandra Gutierrez contributed reporting to this article. Correction: An earlier version of this story contained a line suggesting the Governor’s Administration helped organize the rally.